Roberto’s Dubai has announced that it will welcome the largest fresh white truffle to have ever entered the UAE. At 1005 grams (1.005kg), the truffle is a record-breaking achievement for not only the famous fine-dining Italian restaurant, but also for the UAE. The impressive 1005 gem was found on 4th November on the Tuscan Hills (near Siena) in Italy by two truffle dogs, Tina and Chira. A Tuber Magnatum Pico truffle, it’s one of the rarest types found worldwide and is of an approximate value of $51,000 (AED 187,000). 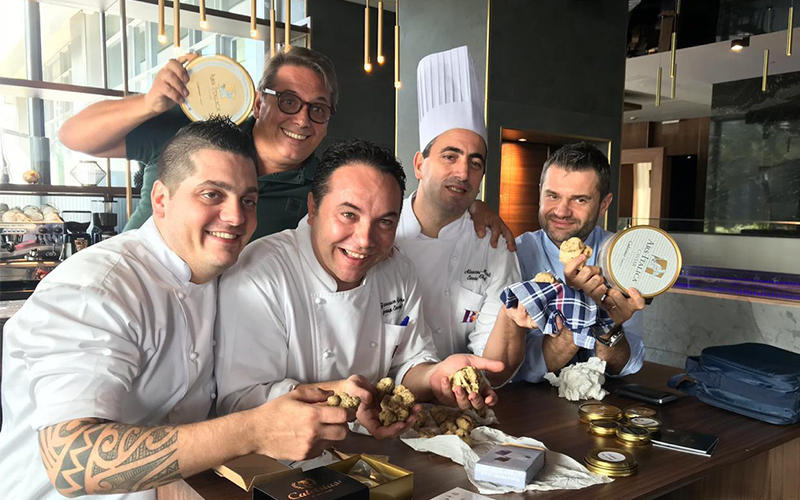 The special truffle will be welcomed by Roberto’s team of highly-trained international chefs who will use the delicacy in dishes prepared for guests from its white truffle menu which will be available throughout the month of November. The menu will feature Italian favorites such as Burrata cheese (with 1g white truffle shavings) for AED 132, Homemade chitarra spaghetti (with 2g white truffle shavings) for AED 200 and beef tenderloin polenta and mushrooms (with 1g white truffle shavings) for AED 495. Group Executive Chef of Roberto’s, Francesco Guarracino worked closely with Massimo Vidoni (also known as ‘The Truffle Man’ and founder of Italtouch) to bring the special ingredient over to the UAE. If you enjoyed this story, you may be interested in reading more about truffle menus on offer in the UAE.